A particularly bad winter in 1869/1870 lead to the Edinburgh Association for Improving the Conditions of the Poor to commit to trying to feed the hungry in whatever way they could. One way they did this was to establish a hall on Chalmers Close where Penny Dinners could be purchased. The dinners consisted of either a basin of broth and a slice of bread for a penny or a plate of meat and slice of bread for twopence. In its first year, 22,809 dinners were sold. 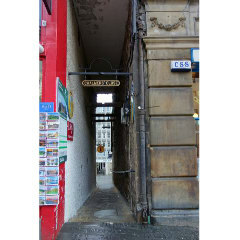 The Association also took over running a soup kitchen in the Canongate which opened every winter. Between the months of January and March 1869, the soup kitchen gave out enough rations to feed 50,000 people. This doubled the following year where a longer opening period meant that the kitchen gave out enough rations to feed upwards of 100,000 people.